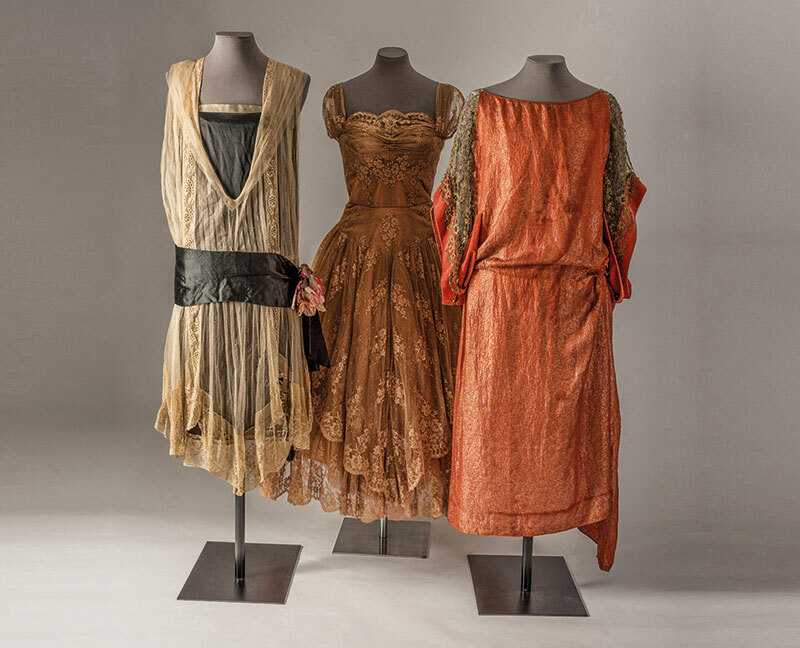 Three lace dresses comprising Raschel peach machine-made lace by Callot Soeurs (about 1926), Levers peach machine-made lace by Hardy Amies (1950s) and gold metal thread machine-made lace by Jeanne Paquin (about 1924). 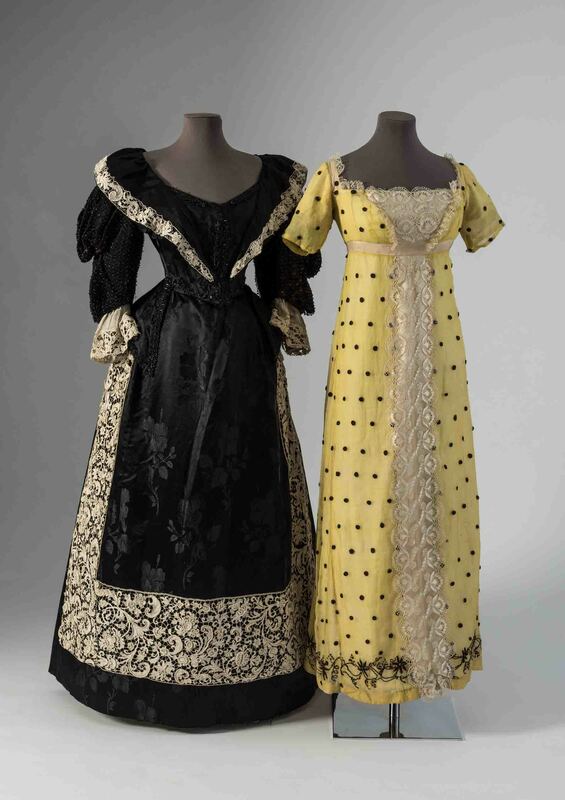 Two dresses comprising Venetian Gros Point needle lace (1600s) and silk blonde bobbin lace (about 1815). 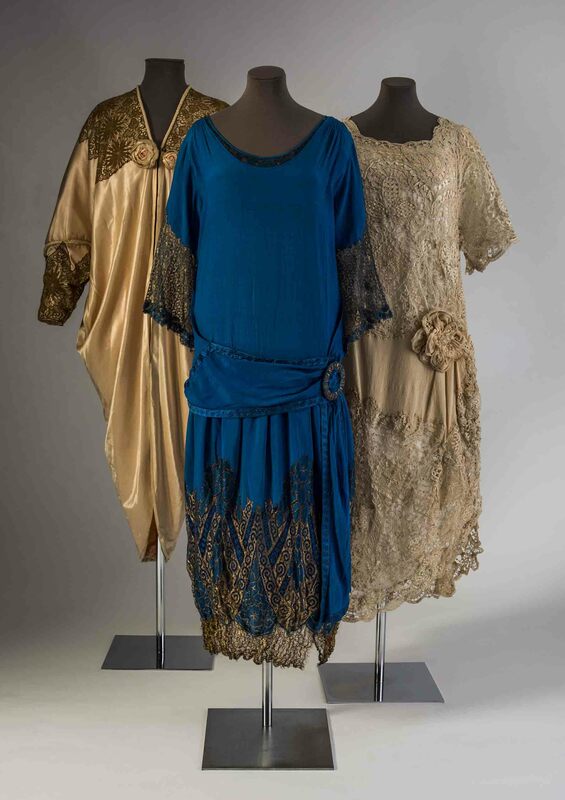 Three lace dresses comprising Leavers machine-made gold metal thread lace (1920s), gold metal thread chemical lace (1910), and machine-made tape lace and braid (1920s). 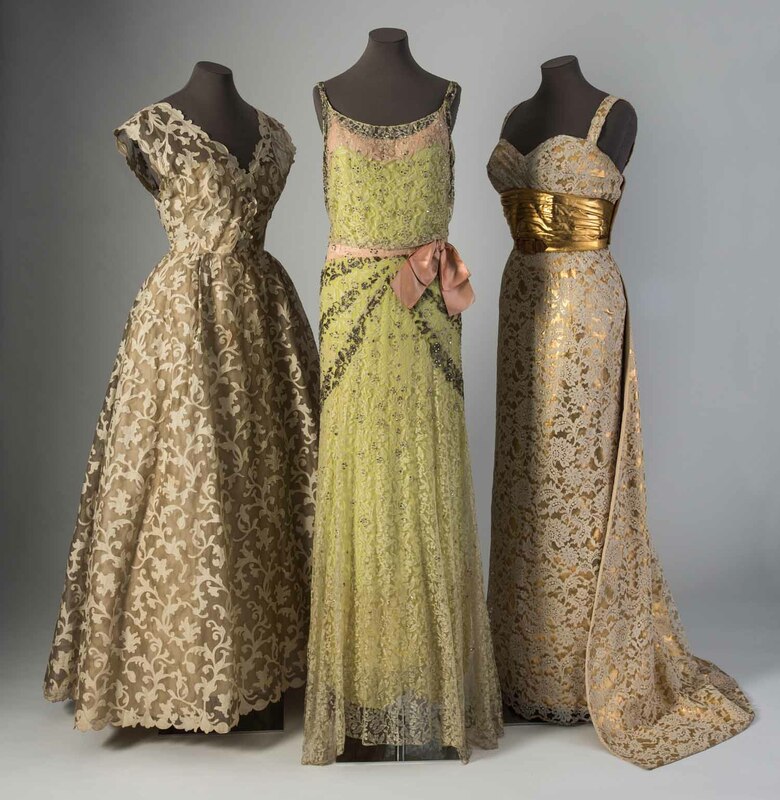 Three lace dresses comprising poplin applied to organdie by Balenciaga (1950s), Leavers machine-made lace by Molyneux (1930s), Leavers machine-made lace over gold jersey by Balmain, (1953). It was marked as contraband for some time in Europe, and has over eras been created, destroyed, flaunted, desired and passed down, making for many interesting tales. Once a sign of prestige worn by aristocrats, there soon came a time when it became more affordable and readily available. Spun in linen, wool, cotton, silk or metallic gold threads, lace has been a constant at every major fashion event around the world. This year, the Fashion Museum, Bath, presents Lace in Fashion, an exhibition of 50 gorgeous examples of the delicate and decorative fabric. The oldest piece on view is a smock with Flemish bobbin meshwork on the sleeves and collar, from around 1580. Other gems include a silver tissue dress — trimmed with exquisite parchment lace — from the 1660s, a navy blue lace dress worn by Léa Seydoux in Spectre (2015) on loan from Australian design duo Lover, and evening gowns by Balmain, Balenciaga and Molyneux. Curator Elly Summers has catalogued the material’s history from the 1500s to the present day — documenting its place as a wardrobe staple for centuries. A dress made in 1 805, and perhaps the sole surviving outfit to be worn by Queen Charlotte of Great Britain, is one of the showstoppers. Providing a close look into the fine handiwork that gives lace its regal look and how major houses such as Burberry, Alexander McQueen and Christopher Kane are challenging its traditional applications on the runway are some of the highlights of this year-long exhibit. Lace in Fashion is on display at the Fashion Museum, Bath, UK till January 1, 2018.